In six matches for Storm, Mandhana has scored 338* runs, which is also the highest score by any individual in a single season. Star Indian batter Smriti Mandhana is on fire in the ongoing Women’s T20 League in England. On Sunday, she played a key role for the sixth match in a row as she scored 56 off just 36 balls to help her side to a successful chase against Yorkshire Diamonds. Western Storm, the 2016 runners-up and 2017 champions in the Women’s Super League, has secured Smriti Mandhana’s services for 2018 and what a signing the 22-year-old Indian batter has been for the team. Mandhana is the first Indian cricketer to play the annual Twenty20 tournament followed by India’s T20 skipper Harmanpreet Kaur. 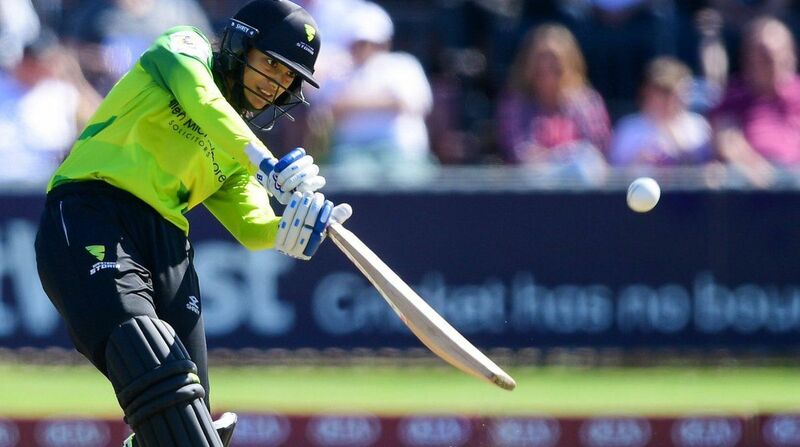 In six matches for Storm, Mandhana has scored 338* (48, 37, 52*, 43*, 102 and 56) runs, which is also the highest score by any individual in a single season. Smriti Mandhana is ranked number four in the ICC Women’s ODI Rankings for batters and No.13 in the corresponding list in T20I cricket. “Smriti’s just effortless. She’s so pleasing on the eye, keeps it simple and hits it straight. Everything is going her way at the moment, even those ones that fall into gaps,” Knight concluded.